Following stints in Depeche Mode and Yazoo, keyboard maestro Vince Clark teamed up with singer Andy Bell in 1985 to form Erasure. As the 1980s progressed, many of synthpop’s early pioneers – Kraftwerk, The Human League, Gary Numan – seemed to have disappeared from view, leaving the likes of Erasure and Depeche Mode to carry what remained of the early synthpop baton through the remainder of the decade. A string of hits followed, peaking with their run of albums and singles from The Innocents in 1988 to I Say, I Say, I Say in 1994. There’s been a synthpop renaissance in recent years, with acts like Robyn, Hurts and La Roux rising to prominence. It makes sense that Erasure should benefit from the recent reinvigoration of the genre, and the choice of Vincent Frank (aka Frankmusik) as producer brings a sense of things coming full circle - he cites Erasure as an influence on his own sound. The single, When I Start To (Break It All Down), is a plodding, beige take on electronica which appears to be aimed squarely at a Radio 2 audience. Thankfully, it’s not an accurate representation the rest of this album, much of which bleeps and squiggles with the effervescence of acts half their age. Whole Lotta Love Run Riot is classic Erasure with a modern twist, its pulsating trance feel is one of the better examples of Frankmusik’s production bringing their sound into the 21st century whilst still sounding retro. Melancholy and mid-paced, Just When I Thought It Was Ending could be a track from any of their early albums (and that’s a strength), while the scudding euro-dance of Be With You has echoes of The Human League and Giorgio Moroder. Tomorrow’s World isn’t a bad album but it’s not a complete ‘return to form’ either. Its strength is having enough of a sense of songcraft to add weight to the keening, theatrical melodrama of Andy Bell’s vocals. The production definitely gives their sound more currency, but you get the impression that Erasure are a bit late to the party - ironic when you consider how long they’ve been around. Aside from the choice of producer, there isn’t much in the way of surprises because this is basically an updated take on how you’d expect an Erasure record to sound: accessible songs, flamboyant vocals and fizzing synths. It may be a bit late in the day for the duo to gain any new fans, but in never veering too far from their established template, this record should find a home with what remains of their once considerable fan base. 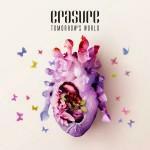 Despite the air of business as usual, Tomorrow’s World is Erasure’s strongest album since the mid-90s. That’s some sort of progress, surely?